Keith Cohen, owner of the 100-year-old Orwasher’s Bakery on Manhattan’s Upper East Side, created this fruit and nut studded ‘Holiday Challah’ as a sweet and light-hearted way to celebrate the holiday season. 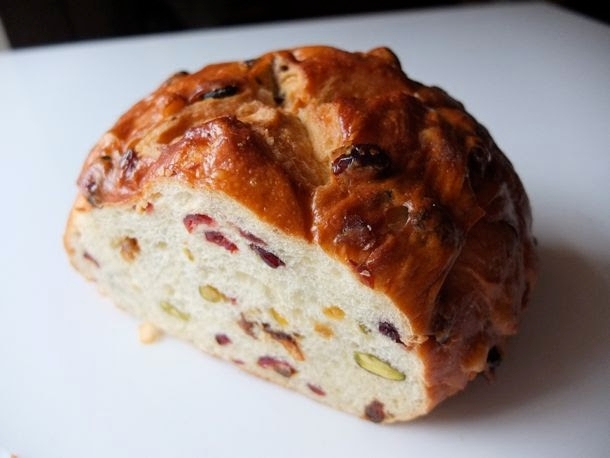 This bread has a beautiful interior that is sprinkled with color from the dried fruit and pistachios. The Holiday Challah is great as toast with tea or coffee—or even better–slice it thinly and bake the slices on a sheet pan until crisp, making a biscotti-like treat. Set up stand mixer with a dough hook. Place flour, water, egg yolks, oil, sugar and salt in mixing bowl. Mix on medium-low for 5 minutes, then mix on medium-high for 2 minutes. Mix on medium for an additional 6 minutes. Add cranberries, golden raisins, pistachios, and orange zest. Mix on low until dry ingredients are combined into dough. Dough temperature should be between 76 degrees F and 78 degrees F. Dough should appear shiny and pull away from the mixing bowl. Take the dough out of the mixing bowl and transfer to a lightly oiled airtight container. Let the dough rest on counter top for approx. 3 hours. Dough should double in size. Roll dough out of container onto a lightly floured work surface (marble or butcher block is ideal). Cut dough with a scraper into 4 even squares/rectangles, approx. 1.25lbs/567g each. Shape each into a boule. Let dough rest 4 hours after shaping. Score and “X” in the top of the loaf. Preheat oven to 390 F. Bake for 33 minutes until lightly golden brown.